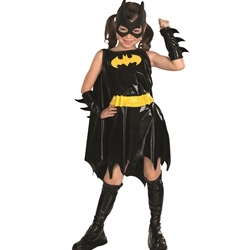 Your child can dress-up as Batgirl from the Batman comics in this officially licensed DC Comics Batgirl kids costume. This costume is perfect for Halloween or super hero dress-up play time. The Batgirl kids costume is colored as pictured. Costume includes dress with attached cape, belt, and boot tops. Costume is available in child girl’s size small, medium, or large.